St. Patrick's Day is kind of a big deal in our house. We put up the shamrock decorations and we wear green, and I also try my hand at recreating Irish foods. Last year we had corned beef and cabbage. This year, I think I'll be making shepherd's pie, but I don't stick with the traditional ingredients that the recipe usually calls for because I have a house full of picky eaters. I have to tweak most of the recipes to suit my family's taste preferences. So, to put more green on our plates, I'll be adding a green side dish this year. We just got a Fresh Thyme grocery store in our area, and the produce prices are amazing. I've been loading up on fresh asparagus for half the price that my other local grocers have it priced. Since I have it stocked in abundance right now, I thought it would be a nice addition to green up our St. Patrick's Day spread this year. Golden Blossom Honey has several delicious looking asparagus recipes listed, but when I was browsing them, I immediately honed in on this Roasted Asparagus with Mushrooms recipe. Minimal ingredients and roasted in 20 minutes makes this my kind of side dish! Plus, it's so tasty, I just want to eat it right off the serving dish! What are you serving for St. Patrick's Day this year? When is St Patrick's this year? It's in just a few weeks. Seems like this year is already flying by, doesn't it? I never thought I'd like asparagus , so I always skipped it at the store. Then I saw a ranch asparagus recipe a few years back on another blog that piqued my interest, and have been hooked ever since. I love eating the red radishes raw. Now, horseradish? No, no, no for me. Jason loves it and has to buy his own little jar when we have dishes that he likes to eat it with. I've tried it with many different foods and it just does not fly with me. I'm on a diet. No, I'm not kidding. Blue, I am sure you don't need no stinking diet! Dezzy, we (as in Jason's family) usually has it on Christmas with their Prime Rib. I think they serve it at the bar with wings too. I once thought it was ranch dressing and gave my self a nasty surprise. I think people like to eat it with celery, too. I love picky eaters. They know what they want :) Yes, I'm biased. This looks so yummy. I need to make this for my husband, he loves asparagus and mushrooms. I have not decided what I am making for St Patrick's Day yet. Wow, I love it, it looks so delicious, and my daughter would love this! When I saw the picture, I was like "Aw, she's not working with Golden Blossom Honey any more." Then I got a pleasant surprise. That looks so delicious. I would love to try this at home. We do love honey at our house! This sounds good. I like asparagus I didn't even know though until my son and his wife were visiting a few years back and made it fresh. My mom had always used canned (ew) so I thought I hated it. Anything green and leafy would be perfect for the holiday! I would love to try this. Thanks for the recipe! I love asparagus and mushrooms! I had a beautiful patch of it but hubby accidently sprayed it many years ago so now I just eat the wild asparagus that grows in our yard I can hardly wait for the snow to be melted so I can try this recipe. Thanks for posting it. 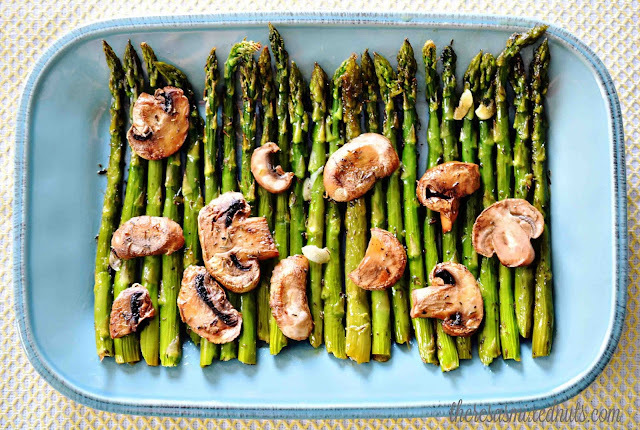 This Roasted Asparagus with Mushrooms recipe looks so delicious and easy to make. I will have to give it a try this week. This looks like such a delicious recipe. 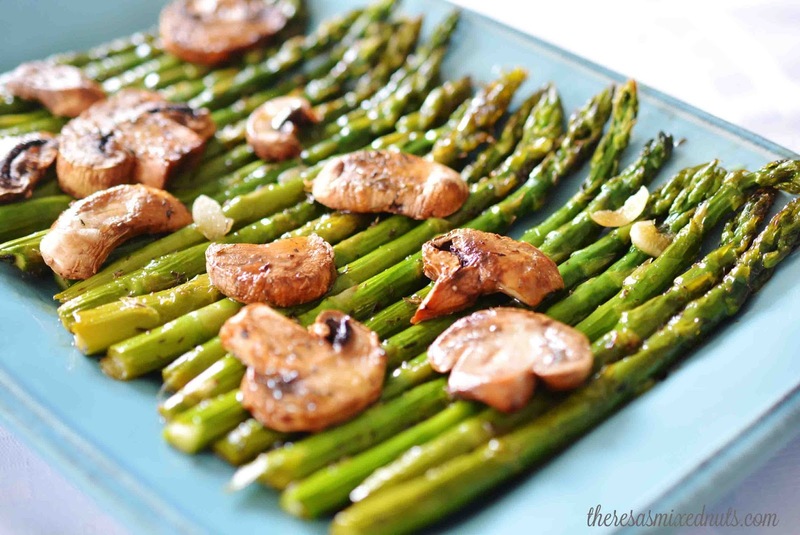 I love asparagus and mushrooms! I usually stir fry mine but roasted mine be even better! I made asparagus with olive oil, sea salt, and parmesan cheese. It was tasty to. I'll have to give your recipe a try. That looks amazing! I'd probably eat a whole plate of it myself. Asparagus is on sale at the local grocery store right now. Gonna have to get me some and make up this recipe! Omg yummy!!! Asparagus is one of the only veggies I can get hubby to eat so I will definitely be making this! Oooh that looks yummy - we are an asparagus living family! Will definitely try that. BTW - started a new job today (finally!!!!) Yay!! Yay! That's wonderful news! Good luck! My husband loves asparagus. I need to make this for him.